In honor of Hillary Kerr and Katherine Power’s latest book, The Career Code: Must-Know Rules for a Strategic, Stylish, and Self-Made Career ($12), we’re running an interview series featuring 17 questions (in honor of the book’s 17 chapters) about the work lives of the most inspirational female leaders in the fashion industry. So far, we’ve tapped Yael Aflalo, Lauren Conrad, Rachel Zoe, and more. Up next? Susan Gregg Koger. While many 17-year-olds see college as a four-year opportunity to figure out what they want to do with the rest of their lives, Susan Gregg Koger figured things out early on. 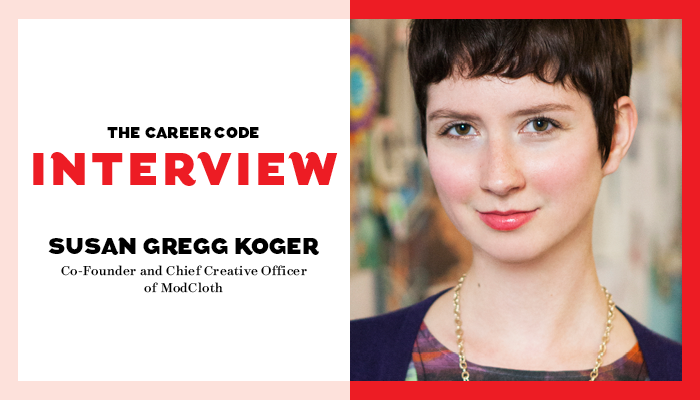 Koger founded women's retailer ModCloth in 2002 with her then-boyfriend (and now husband) as an outlet for her love of vintage shopping. They started the company in their dorm rooms at Carnegie Mellon University, and she now serves as the chief creative officer of the 350-employee company that, as of 2015, is worth $150 million. Koger, who is now based in San Francisco, not only provides vintage-inspired fashion at a wallet-friendly price point for women around the world, she's also doing her part to change the fashion industry for the better, including being the first retailer to take a no-Photoshop pledge and removing ModCloth's plus-size section in favor of adding extended sizes for many of its products. Keep reading to hear about Koger's impressive career and get invaluable advice from this successful young fashion industry entrepreneur. "I lead the creative teams at ModCloth that design our namesake collection and develop the artistic story of our brand." "The amount of time that I'm sitting behind a desk. Even the most glamorous jobs include mundane tasks like answering email!" "I was a 14-year-old sales associate at a candle and gift store in the mall. I probably wore a velvet maxi skirt and some kind of weird blouse—those were my fanciest clothes at the time!" "Diana Vreeland, the legendary editor. I can only imagine the stories." "I really like looking at personal style rather than traditional outlets, like Instagram, personal style blogs, and the ModCloth Style Gallery." "Any time I didn't trust my instincts. In hiring, in creative decisions, and in business strategy, I've learned that I need to investigate further when I have a bad feeling about something. It's not always right, but important to acknowledge." "1.) Passion about our customer. 2.) Thirst for knowledge: excitement to learn. 3.) People who are nice: a can-do attitude." "The things that make me feel like the best version of myself. For me right now, that means color, bold print, and something that defines my waist." Just add white sneakers and a denim jacket for a cool casual Friday look. Make this office-appropriate by adding a blazer and loafers. Transition into fall seamlessly with this mock-neck frock. "Fairly laid-back and always on the go." "I always go back to our customer. I keep a folder of screenshots of customer emails and social posts telling us why they care about what we do—that always helps me feel more motivated. I've also found that getting outside, even just for a quick break, helps too!" "In anything in life, being honest goes a long way. Be direct. Also, do your best to make your transition out of the business as smooth as possible. Said differently: Don't burn bridges!" "I'm currently loving the Whole Foods salad bar—our downtown L.A. office is right around the corner. I always have a salad with a lot of protein: chicken, edamame, and chickpeas. I like having the option to make it as big or as small as my hunger." "Ask questions to demonstrate how excited you are to learn new skills. A positive attitude, no matter your level, is key too!" "Recently I've been spending a lot of time on my dog Winston's account: @plumplittlepug. "1. @metmuseum: Following this account is like a mini trip to the museum. They post everything from behind-the-scenes events to pieces from the collection. "2. @nasa: I've always loved all things outer space. The deep-space views from the Hubble telescope blow my mind! "3. @theclotheshorse: Rebecca's a longtime ModCloth collaborator, and I just love her style. "4. @marawa: This world-record–holding, roller-skating, hula-hooping badass lady always makes me smile. "5. @natgeo: Thought-provoking, interesting, and beautiful." "In the morning, I do at least 15 minutes of yoga, which helps me set the tone for the day. I try to eat a large, protein-rich breakfast because when I don't, I can definitely feel the difference. I've also recently started using the Headspace app to do 10 to 15 minutes of guided meditation each morning, and I’m really enjoying it. Evening is about spending time with my two dogs, Winston and Blue, and connecting with family and friends. (And, after a bit of a break, usually more work!)" "When my husband and I were first getting started, our business counsel told us that you should never apologize for your age. As a young entrepreneur, she was adamant that we shouldn't work with people who would make us feel like we were lacking in some way because of our youth. And as I've gotten older, it's still valid advice: Don't ever feel like you have to apologize for your age." "Right now I'm working with the team to concept our holiday creative. I can't wait to see it come together!" What would you ask Koger about starting a company at such a young age? Tell us in the comments below, and be sure to check out ModCloth's new arrivals!